Elliott Reeves scores the second goal. Photo by Craig Lamont. 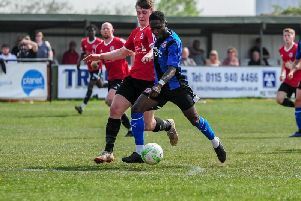 Ilkeston Town went three points clear at the top of the MFL Premier Division with a 2-0 win over fellow high-flyers Westfields on Saturday. Tim Hopkinson gave the Robins the perfect start to the game when he fired home from 25 yards out, in the opening five minutes. Elliott Reeves then rounded off the win, with his fourth goal in two games. The away side pushed for a way back into the game throughout the second half but the Robins stayed strong and held on for the win. Hopkinson fired in his ninth of the season when he beat Westfields ‘keeper Ian Havard from 25 yards out in just the second minute of the game. At the other end Liam Mitchell did well to keep out Jamie Molyneux before doing even better to deny Ben Hayes’ long range effort. Just under ten minutes later Havard was called into action. He did well to tip out Tom Marshall’s long-range driver. Hopkinson was next to be denied by the Westfields ‘keeper, before Kyle Dixon’s follow up was blocked by Paul Hurrell. The second goal of the afternoon came five minutes from the break. Jamie Walker burst away down the left and picked out Reeves in the middle, who turned the ball home for his 11th of the season. There was still time in the half for both ‘keepers to be forced into action. Walker got free in the area and fired an effort goalwards only for the leg of Havard to keep the ball out. At the other end Mitchell did well, diving to his right to keep out Craig Jones’ strike from a well worked free kick. At the start of the second half Reeves came close to getting his second and Ilkeston’s third of the game. The forward got away down the left and fired across Havard only for the keeper to pull off a save. Billy Bennett then did well to get back goal side and take the ball away from Seth Antwi as he went through on goal. The away side then had half-hearted appeals for handball turned down after Jones’ curling effort was blocked on the edge of the area. The visitors continued to push for a way back into the game but other than a number of corners that were comfortably dealt with, they failed to create any real chances until the 90th minute. A free-kick from the right picked out Sam Plane, who had ghosted into the six-yard box unmarked, but he failed to hit the target putting his header wide of the post. That was the last chance of the game as Ilkeston held out to go three points clear at the top of the league with their fourth consecutive win. Ilkeston: Mitchell, Wheatley, Bennett, Shaw, Baker, Dixon, Whitehurst (Piliero 68), T Marshall, Reeves, Hopkinson (A Marshall 74), Walker (R Wheatley 89). Subs not used: Lavelle-Moore, Whyman.